There have been lots of false alarms about TVR’s future over the years since it went into administration in 2006. But there’s finally reason to be positive that we could well see the moribund and much-loved marque make a return following the news that the rights to the name have been bought by a UK-based entrepreneur. The Internet’s been alight with TVR speculation, since the company’s website began posting cryptic messages on its homepage. The www.tvr.co.uk site’s main message changed to ‘Never say never’ last week, and currently it’s announcing, ’Thunderous news! The distant rumble of rumour has turned to thunder and TVR is back in Britain!’ The speculation ended when it was confirmed that the rights to use the TVR name have been sold to Surrey-based businessman, Les Edgar. Not only does he own the rights, but he has also bought the rights to manufacture components for old TVRs. He’s also state that there will be a full announcement about TVR’s future shortly. The beginning of the end for TVR – as was – can probably be traced to Peter Wheeler’s sale of the Blackpool company to Russian billionaire Nikolai Smolenksy in 2004. The company changed focus, moved upmarket, and left its traditional heartland of the affordable muscular sports car open the opposition. The Sagaris might have been mightily quick, but it was also expensive, and not without problems – and in 2006, it was cancelled, taking the company with it. There have been several attempts to relaunch TVR in the ensuing years. TVR announced the Sagaris 2 (above) in 2007, which was to be built in modest premises near Kirkham in Lancashire. That never happened, and so the most credible option occured in 2010, when a deal with FMS, a German specialist firm that manufactures the Gullwing and AC MkVI in Meissen, was mooted. The plan was to produce a GM LS3 open topped sports car, and built it alongside the AC MkVI. The deal fell through when the two parties couldn’t agree terms. Smolensky’s aid told our sister site AROnline at the time that it didn’t matter where any new TVR was built, and it certainly didn’t need to return to the UK. 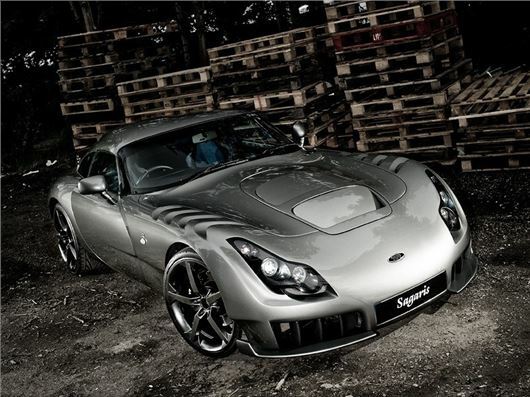 TVR continued to offer parts and specialist support, and announced on its website in 2011 that the Sagaris could then be built to order, but series production never restarted, and as far as we know no new cars were completed. Smolensky threw in the towel in 2012, winding up the company after coming to the conclusion that a revival of TVR was not going to be financially viable, ending TVR’s continuous history as a car manufacturer since the formation of TVR engineering in 1947 to an end. Less than a year later, it would seem that we could be on the brink of a relaunch thanks to Les Edgar.